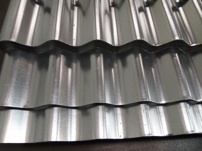 Galvanised corrugated sheeting is available from stock, in precut lengths, or manufactured to order to your specific requirements. We can also supply this colour coated, in a plastisol material with a cover width of 991mm. We have a warehouse based in Grantham, Lincolnshire, and have offices in the West Midlands and Cardiff, Wales.